Kissimmee Florida is one of the BEST fishing destinations in the state. Families travel to this incredible place every year with the intention to spend time in the outdoors. What they don’t know is that there is excellent fishing just around the corner. 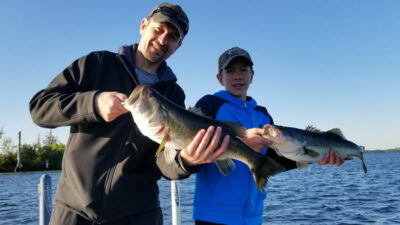 Take a break from the rides and theme parks and enjoy a fishing trip on Lake Toho in Kissimmee. Enjoy this Kissimmee Florida Fishing Report giving you insight of what it can offer. Lake Tohopekaliga is an amazing fishery that is highly productive all year long. If you are looking for big bass and great numbers of fish, this is the fishing destination for you. Our locala experts are on the water daily making sure they know where and when to cast a lure or bait. When you come fishing on Lake Toho, Captain’s Brent Nelson, Steve Niemoeller and John Leech will put you on the best fish possible. Captain Brent Nelson has had some excellent days on the water and will continue to find big fish all summer long. 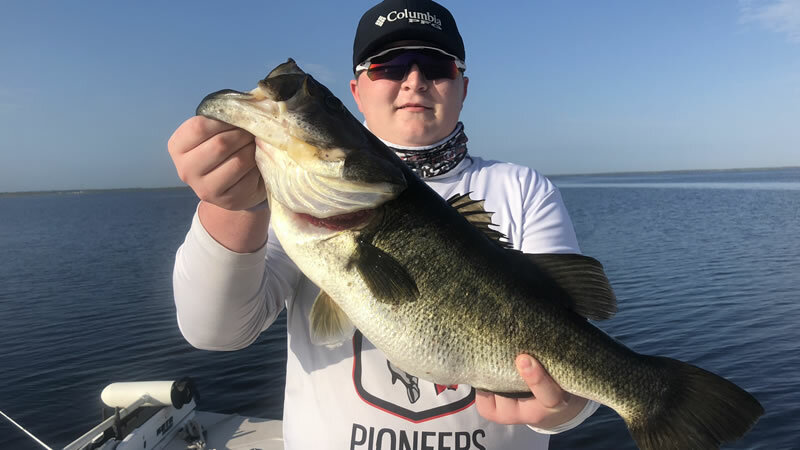 Dewayne and Kolby were traveling to Kissimmee to enjoy some family time and took a break to fish Lake Toho in the morning. These guys really knew how to fish and put some quality bass in the boat. Summer time bass fishing calls for live wild caught shiners along with several artificial baits. Rainy days allow flucatations in water levels as Florida Water Management moves it in and out. When the water is low, you tend to find the bass schooled in key areas on the lake. Kolby landed his personal best on a shiner weighing in at 8 pounds. They also caught several quality fish on flukes and speed worms. If you are looking for excellent fishing, give Lake Toho a shot and be wondered by the success. Captain Brent is looking forward to fishing with Kolby again in the future. Shortly after this trip, Captain Brent went out fishing with Ryan and his son Max. 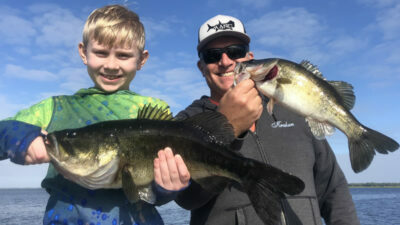 One of the pleasures of being a fishing Captain especially for bass fishing is when Fathers and Sons come out fishing. The action was hot and heavy right from the start. Morning time bass fishing is the best time to get out on the water. Ryan and Max were fishing a quick 4 hour fishing trip before heading back to family. 4 hours was all they needed catching over 20 bass weighing up to 4 pounds. Captain Brent targeted schooling fish. We are looking forward to when they come back to Visit Central Florida again to land several more quality largemouth bass. Afternoon Fishing Trips can also produce an excellent bite this time of year. Captain Brent fished with two men that wanted to change things up. They started with artificial baits and ended with shiners. Zoom Speedworms and Shad colored spinner baits put numbers of bass in the boat. As the sun was starting to go down, action picked up again. These men put a 5 pounder in the boat on artificial baits but the best fish was to come last. While boating 20 plus largemouth bass, they also caught a 6 pounder to top the day off. Whether the morning or afternoon trip fits your schedule the best, you will still produce great fish. Also, the temperatures will be lower than in the middle of the day if you stick to sunrise and sunset fishing trips. Captain Brent is looking forward to fishing with these gentlemen again in the future. Youth Fishing is one of the most reward aspects of guiding. Passing on and sharing your passion with the younger generation helps grow the sport of fishing. Captain Brent got to fish with a wonderful family on his next fishing trip. Sophie, Bella and their mom and dad came out fishing on Lake Toho. The shiner bite was strong right off the bat landing quality bass on the first cast. These young ladies and their parents boated over 20 bass weighing up to 4.5 pounds. You really can’t beat a day like that on the water. 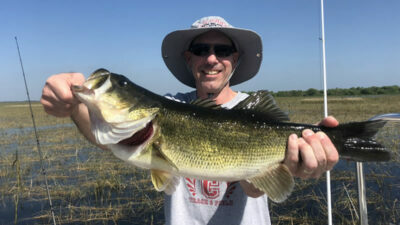 The fish are on the move and Captain Brent continues to stay on top of them in this Kissimmee Florida Fishing Report! Captain Steve Niemoeller also had an amazing day on Lake Toho. Terry and Jody were traveling from Utah and wanted to explore what Kissimmee had to offer. While visiting Family, they wanted to get out bass fishing. They are repeat clients of Bass Online and knew that Captain Steve would get the job done. When you go fishing here in Central Florida, you never know what you can expect. Enjoy watching an array of wildlife or just relaxation time out on the water. While doing all this, also get excited to reel in numbers of quality bass. 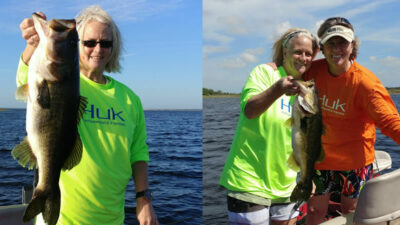 Terry and Jody landed 25 bass in their 6 hour fishing trip with the best weighing 5 pounds. Captain Steve focused fishing shiners along hydrilla weed line where they knew the bass would be laying. The wind blew a little keeping the day cool and comfortable. A nice breeze makes summer time fishing even better. We are looking forward to seeing them next time while they are Visiting Florida. Captain John Leech has been fishing Lake Toho for over 20 years. There is not a single person that knows this Lake better than Captain John. Jason and his son came out to have a little competition on Captain Johns boat. They had a wager who was going to catch the largest bass. When fishing Lake Toho, you have to be ready for anything. Always bring light jackets especially this time of year to either protect for rain or stay out of the sun. Jason and his son wanted to catch a personal best and Captain John made it happen. They landed over 20 bass with the biggest being roughly 5 pounds. That is the ultimate blessing about Central Florida lakes, you can catch that big bass all year long. Don’t miss out on your adventure here on Lake Toho. Kissimmee, Florida is the ultimate bass fishing destination and it is just a short drive from all your major theme parks. We hope you get to Experience Kissimmee to its fullest degree while getting out in the outdoors and soaking up the Florida sun the right way. We look forward to seeing you on the water next time in our next Kissimmee Florida Fishing Report! 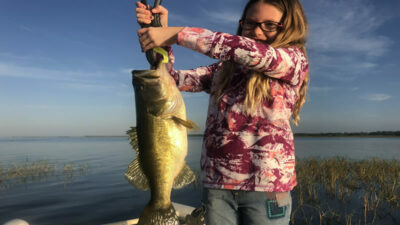 If you enjoyed this post about Kissimmee Florida Fishing Report, you might also enjoy this fishing report from the same area.